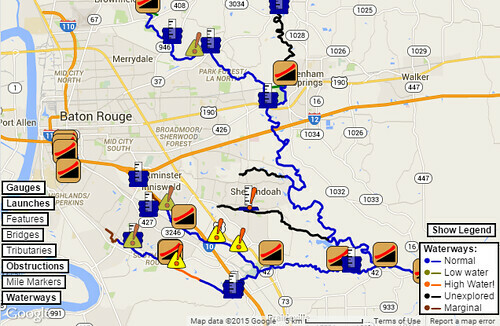 PaddleBR now has a wonderful Google Maps based PaddleBR Map. Gauges, launches, things to judge distance by (features, bridges, and tributaries), obstructions, and more. All update automatically with gauge readings from the USGS Water Services site, so you can see at a glance what it’s like out there. Hi, I am not originally from this area but have lived here for quite a while. I have always wondered how much there is to see on these small bayous from a boat and also how accessible it was. I have just purchased a Perception tribe 13’6″ for family paddling on the lakes. Is this too big to take on these bayous. I thoroughly have enjoyed reading about your travels. I usually paddle an Old Town Guide 147 (or 159) canoe, so the Perception Tribe 13.5 is a foot (or two) shorter and about six inches narrower than I am. (When I rig the Canoemaran for cleanups and such, I hit almost seven feet wide.) 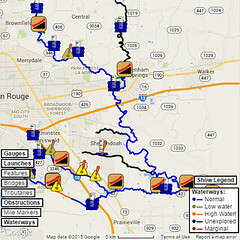 Since I don’t have problems on Bayou Fountain, Bayou Manchac, or Ward Creek, you should be quite clear. Ward Creek does have a few bridges between Siegen and Bayou Manchac that the Canoemaran might not make it through at the moment, but paddling canoes through was no problem. Bayou Fountain gets small catches of logs and flotsam (especially when it’s been high), but those can be paddled through/over if you hit them before I take care of them. Of course, on Bayou Fountain there’s also Rackley Bridge 1/3-mile down from Highland Road Park, but that only requires getting out and going around when the water’s quite high. The pipe section at the top of the chain gauge at Archery Launch shows how much clearance there will be before you launch. The bridge is *approximately* equivalent to 8.3′ on the USGS gauge at Bluebonnet, and if there’s a current, you’ll actually have a bit more than that rule of thumb indicates. There are several huge spiders blocking the archery launch! The last month or so, the spiders have really been building. I saw one web that had to be at least 30 feet up and spanning the entire width of the bayou. Since they seem to love wide open spaces, it’s not too surprising they’d web up Archery Launch, hehe. 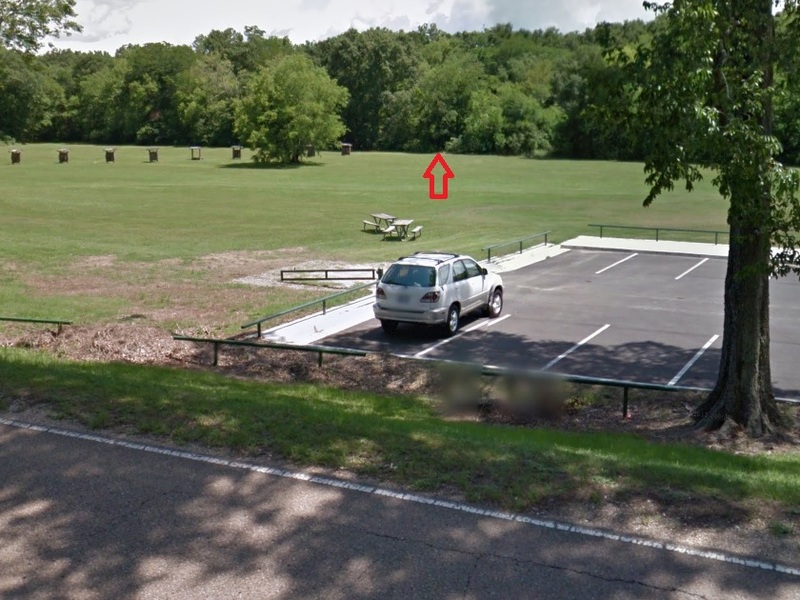 What is the best exit point if you don’t want to paddle back up to Highland Road Park? If you are making this paddle again soon my son and I would like to join you. Ah, you’ve asked the question with no really good answer yet. I’ve heard of people going to Alligator Bayou to get out (half a mile to the right when you get to Bayou Manchac), but the bank there’s still private property at present. One guy was having his wife do a pull-over pickup at Perkins Road (about 0.85 miles downstream from Bayou Fountain). Others have done the exit at the Manchac Park Fountain (two miles past Perkins). We’re trying to get more and better access points, but right now, they’re rather spare and sparse. Still, I’m out there just about every Saturday morning, and I’ll be on the bayou again tomorrow.